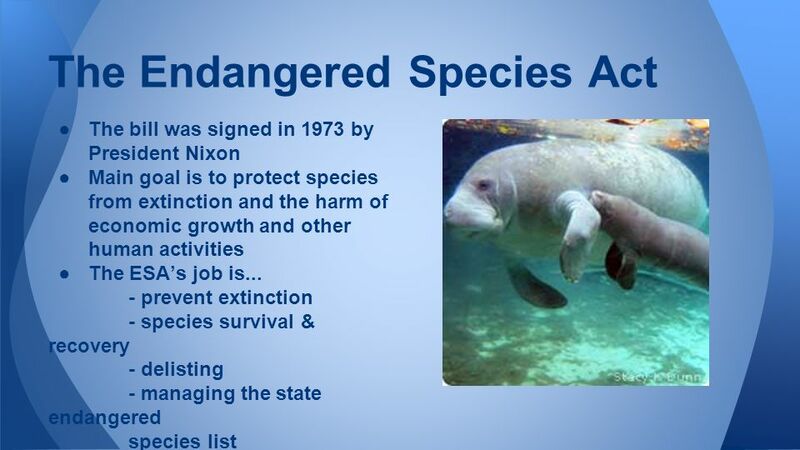 The Endangered Species Act was enacted in December 1973 as an environmental law. The act advocates for the conservation of endangered species and the ecosystem on which they depend. ESA decides to list a species as endangered due to any of the following reasons; Current or possible destruction or modification to the habitat of the species, declining population number of a species due to predation or diseases, concern by environmentalists who request for the species to be listed for monitoring, inadequate regulation of the species, and man-made or natural factors affecting continued existence of the species. The species can also be listed if it has never been used for commercial, scientific, recreational or educational purposes. ESA is known to classify species into two main categories; endangered and threatened. A threatened species refers to one that is at risk of endangerment in the near future whereas an endangered species refers to one that appears to become extinct soon. This only means endangered species is a more serious category than threatened species regarding extinction. As of today, animals have the most endangered species than any other group. This is as a result of such factors as diseases, loss of habitat, human predation, lack of food, and climate change. The act protects species through two processes namely petition and listing and candidate conservation processes. The California Condor is a type of bird species that once became extinct in the wild in the late 1980s. Its population was increased through a zoo breeding program, and they were released back to the wild. However, these birds are still at risk of extinction since some will still get electrocuted using power lines and others will die due to lead poisoning from eating animal carcasses since the ban on using bullets for hunting will not take effect until 2019. Candidate species – Refers to animal and plant species that have been studied and have been proposed to be included in the list of Federal endangered and threatened species. Critical habitat – Defined as a geographic area containing features necessary for the conservation of a threatened or endangered species and that may need special protection and management. Take – involves pursuing, trapping, hunting, capturing, harming or collecting species that are threatened or endangered. Threatened – Any species likely to become endangered in the near future throughout a large portion of its range.